In the past, Christine Ay Tjoe’s artworks have often been notable for their use of wine-stain reds and sugar-mice pinks. 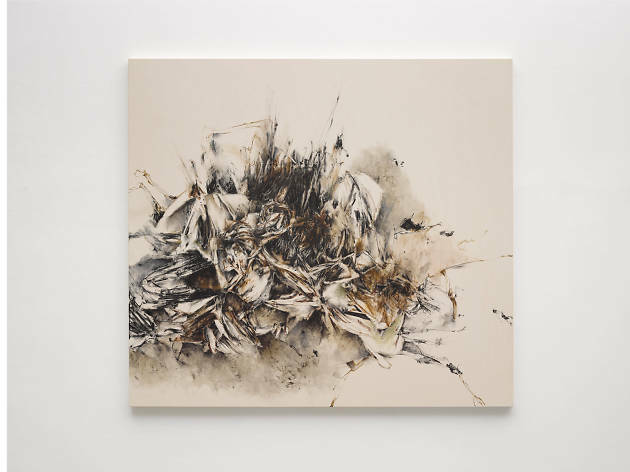 This new series of paintings and drypoint etchings at White Cube goes in an entirely different direction, almost exclusively relying on black and dark brown. The resulting images look like they’re made from old tobacco stains or flakes of crumbling, burnt wood. Although largely abstract, it’s easy to assemble the spindly lines into recognisable shapes or pictures in your mind’s eye. 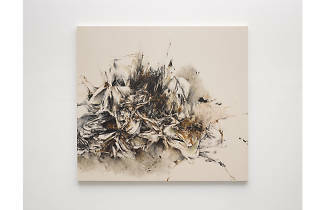 One large painting looks like a mountain vista, another like a craggy rock face with a dead sheep’s carcass splayed across it. Another still looks like a pile of limbs, teeth, bones and perhaps an animal skull. Looked at through the corner of your eye, they resemble a black crow flapping its wings super fast as it tries to take flight. Animals, mountains, trees... they’re all somehow present in Ay Tjoe’s paintings. But what the artist is really exploring is darkness itself, specifically the gloop of bad ‘stuff’ sitting somewhere inside all of us, even if we pretend it’s not. Only one of the paintings here contains the artist’s almost-trademark red. It appears in the top right-hand corner of a painting called ‘Pleasant Breath of the Black’ and looks a stain of dried blood on a crumpled, stained sheet. And if all that sounds a little, well, dark – rest assured that the allure of Ay Tjoe’s art lies in its unsettling ability to look both grotesque and beautiful simultaneously. Her earlier colour-filled paintings often contain the prettiness of a bouquet of roses and the ugliness of a used tampon slowly expanding in the toilet bowl. At the same time. These new ones are similar, mixing together grimy organic matter with a flickering, delicate softness. Because that’s also the artist’s point: the dark bits of us are just as much a part of us as the light bits. And all of it, the good, the bad and the ugly, are a part of the beautiful.